Nissei Plastic Industrial Co., Ltd. is releasing a new hybrid-type vertical-injection molding machine "TNX Series," which consists of 19 types of all-round machines with advanced functions and outstanding energy-efficiency. Its release date is set for January 2011. This new "TNX Series" is a turntable type ideal for many types of insert moldings. TNX Series offers five basic types by clamping force, ranging from 523kN (50ton) to 2156kN (220ton). For injection, center-injection type (vertical injection from top of the mold) "TNX-R-V" or parting-injection type (horizontal injection from side of the mold) "TNX-R-A" can be chosen, offering optimal selections from 19 different configurations (parting injection types are made to order). The key feature of "TNX Series" is its innovative super energy-efficient hybrid pump system "X-Pump," which demonstrates superb injection performance while saving on the running cost. For 50 ton TNX50R, it consumes 70% less power and 25% less hydraulic oil than those of conventional hydraulic machines. By controlling the hydraulic pump by servomotor, the output volume can be switched to optimal amount according to the molding condition, materializing outstanding controllability in wider range of injection velocity and pressure. It also achieves high injection velocity and response time (rise time to reach the maximum velocity), making it excellent for products with large fluidity length (terminal box, etc.) and thin-wall products. * Maximum injection velocity: 300mm/s (2.6 times faster than conventional hydraulic machines). * Injection response time: 60ms (twice as fast as conventional hydraulic machines). Its servomotor-driven pump permits low-flow volume control, and the feedback control is capable in precisely controlling the "velocity setting below 1mm/s," which is impossible to achieve with the conventional hydraulic machines. In addition, controllability and stability in ultra-low pressure range have been improved significantly, which are ideal for thick-wall product and hot melt (low-pressure encapsulation) moldings. X-pump equipped machines can hold "high injection pressure for long duration," which is difficult to achieve with the electric machines. It is powerful in improving quality of thick-wall molded products. TNX Series is equipped with a direct pressure type clamping mechanism, which is resistant to temperature change of the mold and clamping mechanism, generating consistent clamping force according to the setting. It is easy to set optimal (low) clamping force that is friendly to the mold and machine. With its simple and clean mechanism, machine precisions can be maintained for a long time. TNX Series is equipped with a 3-tie bar wide turntable, and the mountable maximum mold dimensions are the largest in industry (up to 20% larger than predecessors). It is capable in accommodating mold for intricate shape products or mold with a slide core. Securing wider work area around the turntable (mold mounting face) and lowering its height make mold setup/change easy and significantly improve workability/operability for insert molding and product takeout. It flexibly accommodates automated systems, such as a robot. Turntable rotation and ejector motion are driven by servomotor. Faster-yet-smooth (low vibration) rotation and simultaneous motion of injection/metering & ejection are possible, achieving faster cycle. 1) 90-degree swing type 12.1 inch color LCD touch screen operation panel. 2) Tilt mechanism that allows the adjustment of screen angle according to the operator's height. 3) Selector type operation switch that prevents setting error and ensures excellent operability. 4) 6-language display (Japanese, English, Chinese, Spanish, Korean, and Thai), which flexibility be utilized in global business environment, provided as standard. 5) Enriched quality control functions, such as a product acceptance/rejection judgment function, and maintenance functions. 6) Loaded with a variety of "practical molding support software." 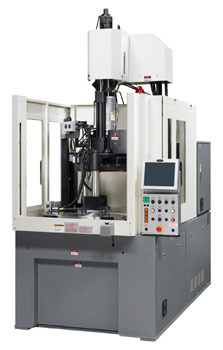 Nissei Plastic Industrial has sold about 10,000 vertical injection molding machines. In order to meet the needs for molders, such as energy-savings and high value-added productions, Nissei is proposing fully-automated injection molding systems with robots for automotive parts, electronics, IT equipments/appliances, and many other applications. (1) Electrical components for automotive parts, connectors for harnesses, and sensors. (2) Audio-visual devices and structural parts for appliances. (3) Encapsulation molding of coil bobbins, etc. (4) LED bases and reflectors. (5) Narrow pitch connectors for mobile devices. (6) Tactile switches for electrical/electronic parts. (7) Mesh filters for automobiles. Debuting this "TNX Series" add numbers to the Nissei Plastic's hybrid type vertical injection molding machine lineups, totaling 28 types including existing STX Series with clamping force of 10~20 tons. 150 units of TNX machines are estimated to be sold annually.